This has become one of our favorite restaurants in Santa Fe. We also like it for special occasions and celebrations. In an earlier post, I mentioned that our younger daughter was visiting with her 10-month-old from San Francisco. During her visit, she and her husband completed the negotiations on space for their new restaurant. That of course called for a celebration, so we made reservations at Terra. Part of the charm of Terra is that it is several miles north of town, and the drive is beautiful. Another part of its charm is the beautiful view of the Jémez Mountains from the deck and huge picture windows of the bar and restaurant. We chose the earliest seating so that we could arrive before the sunset to enjoy one of New Mexico’s incomparable evening displays. We arrived at the front door of the resort and were immediately greeted by the friendly valet. The traditional Santa Fé scent of piñon smoke hung in the air as we passed the blazing fire in the huge fireplace on the deck. As we entered the bar, we were greeted by the bartender and welcomed into a beautiful room flanked by another fireplace – this time modern and chrome – and huge windows looking over the distant mountains. We tried to sit outside in the cool early evening, but the heaters failed to work, even with the attention of the bartender and the manager, so we came back in. That was ok, because it was warm and we still got to enjoy the beautiful sunset along with flutes of New Mexico Gruet sparkling wine and some tasty truffle French fries. Dinner kept up the excellent experience. The room was spacious, beautifully decorated, and blessedly quiet. Another breathtaking fireplace anchored the room with a glass-enclosed wine cellar on either side. Our server was attentive and knowledgeable but not intrusive. The wine selection was enormous. Many of choices were well beyond our budget, but there were enough modestly priced bottles that we easily found an excellent option. The menu presented a lot of hard choices, but eventually we made our decisions, and we were not disappointed. Diver scallop and crispy pork belly with edamame purée was beautifully presented, the flavors blended. 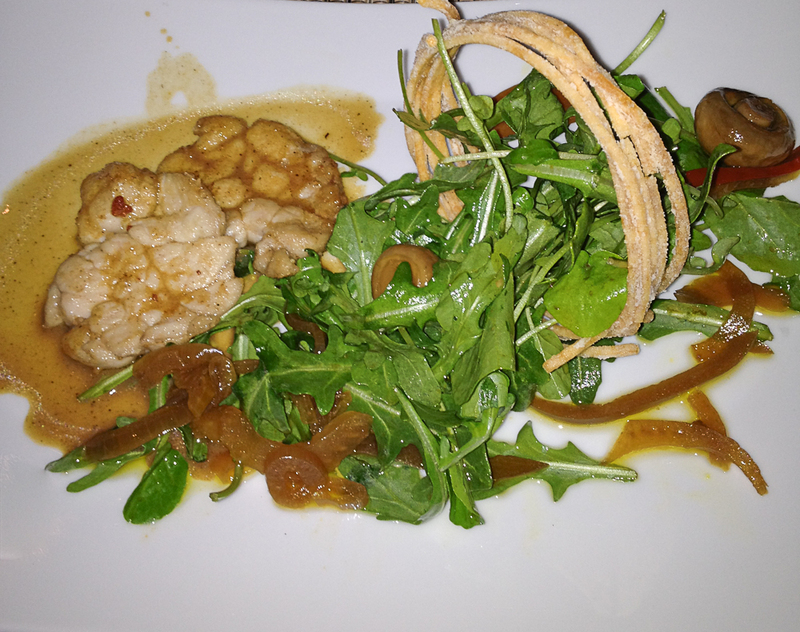 Crispy sweetbread salad had its high and low points: the sweetbreads were crisp yet delicate, just as sweetbreads are supposed to be, and the “potato wheel” was amazing – a single spaghetti-sized strand of potato coiled into a perfect circle and fried to a delicate golden brown. The sauce was bland and needed salt (no chef ever wants to hear that). The mains, though, were flawless. 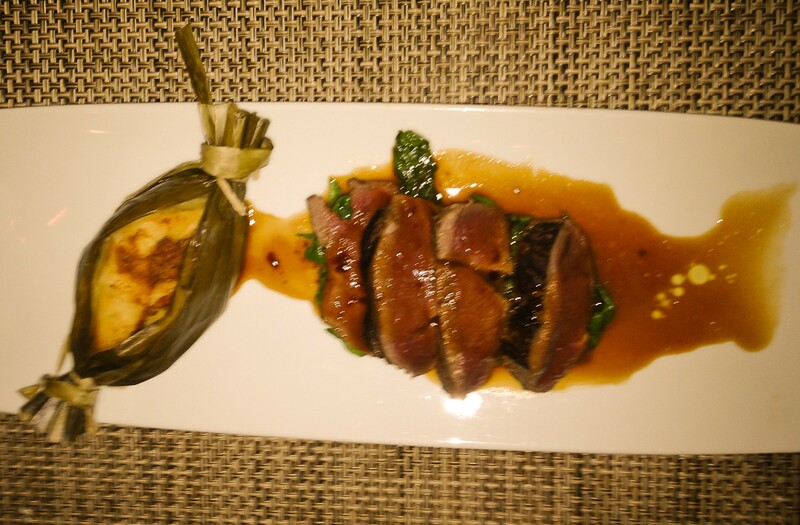 The venison two ways included a creative red chile venison tamal and a perfectly roasted venison lin with Cumberland sauce. 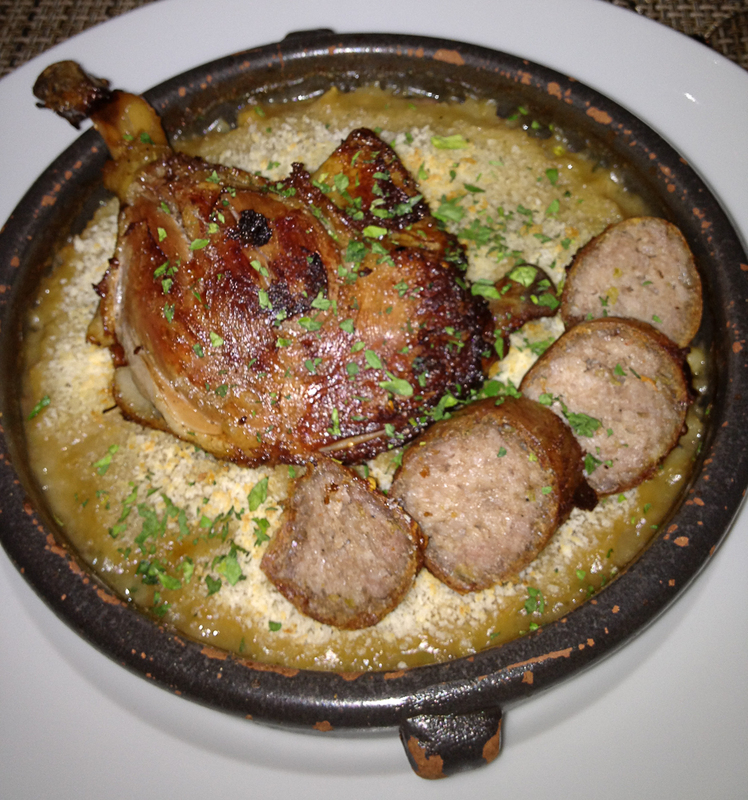 The duck cassoulet was complete with a crispy duck leg and green chile sausage along with the traditional bread crumb crust. The big surprise was that New Mexico chicos substituted for the beans. 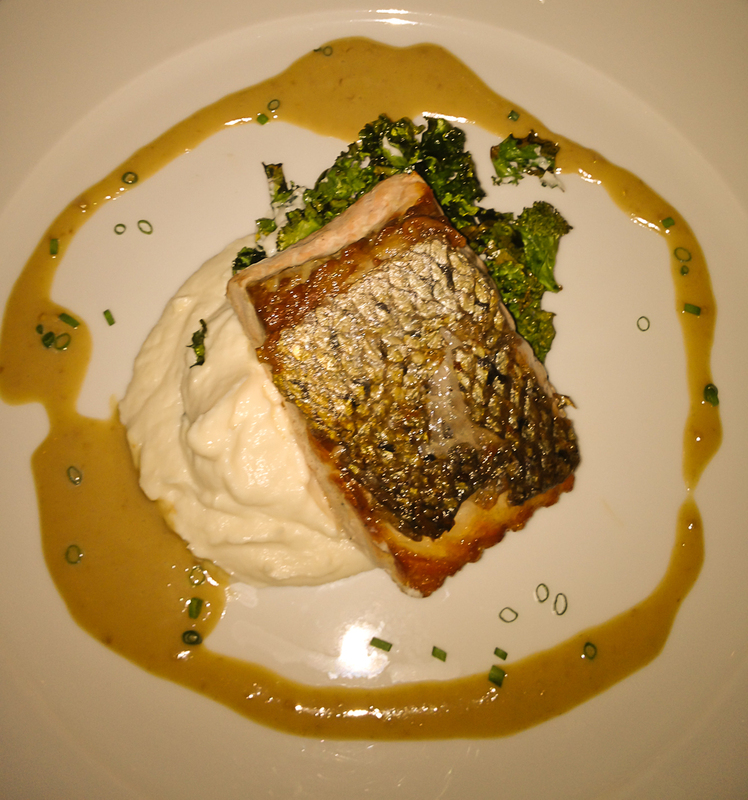 The hot smoked salmon was topped with a crisp “chicharrón” of salmon skin and served with a delicate cauliflower mousse flavored with almond along with roasted kale. Dessert included the traditional street food, churros, but raised to a new level and accompanied by rich cajeta. This last week, we went back with our older daughter, Carol, and her two children. 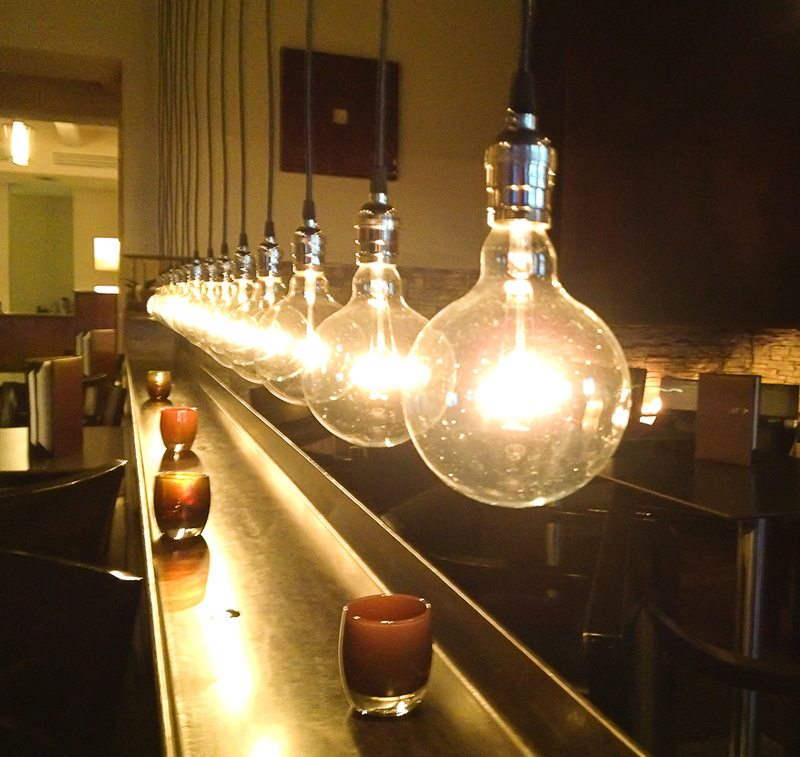 The scene was just as magical, and we now had an opportunity to try more things on the imaginative menu. I had the “West of the Pecos Winter Posole”, which was unlike any posole I have ever had. 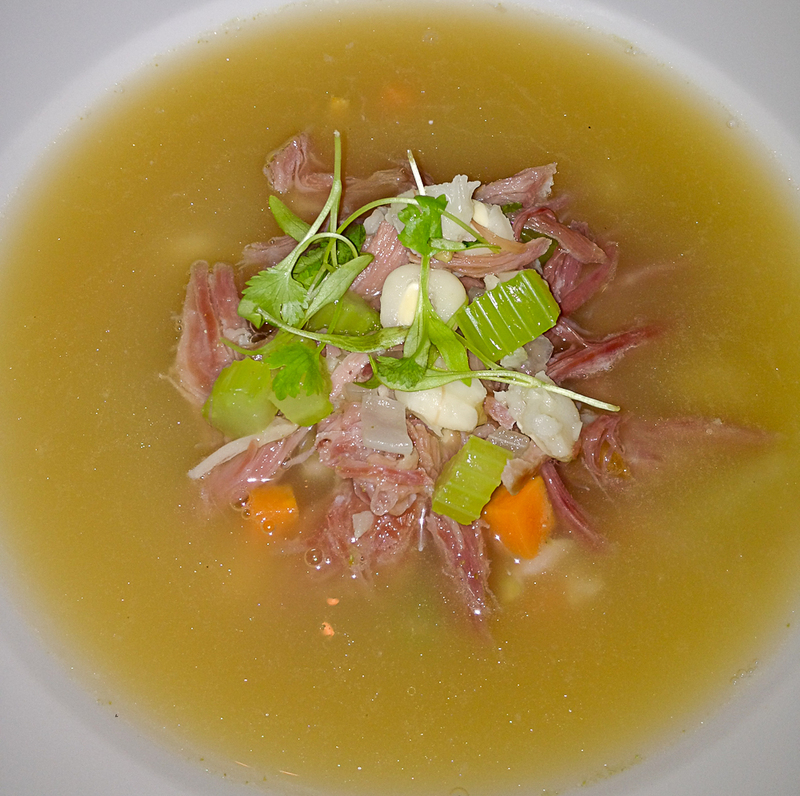 A big bowl was brought to the table with a nest of shredded ham hocks, posole, and micro cilantro nestled in the middle. The server then poured a steaming pitcher of fragrant broth into the bowl. The seasoning is not for the faint-of-heart, but it was a beautiful and flavorful start. 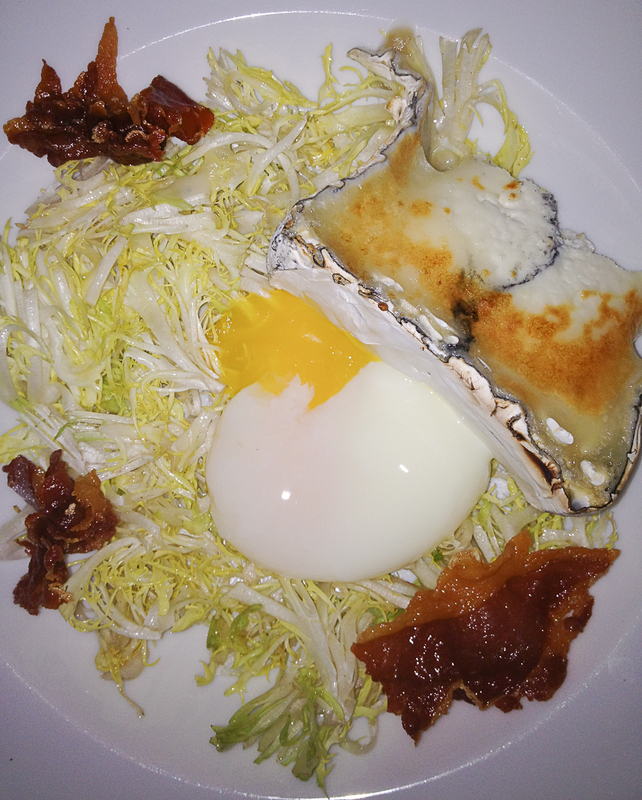 Carol had the warm chicory salad with crispy prosciutto and topped with a glistening, perfectly poached farm egg just begging to be opened so that the yolk could flavor the whole dish. She also chose the Guajillo prawns with – white chocolate molé! What’s not to like about that?! The venison from the week before looked so good, that I chose that. As before, it was well-prepared with interesting seasonings. There was a delicate “cloud” of fois gras foam as an accompaniment. Susan chose the wild mushroom ravioli with rabbit ragu. She pronounced it delicious.